Colorado Parks and Wildlife is hosting a town hall meeting May 10 for sportsmen to discuss proposed improvements to the Landowner Voucher Program with agency director Rick Cables, the agency announced in a news release. The meeting is scheduled to run from 6:30 p.m. to 8:30 p.m. in the Hunter Education Building at the agency’s Grand Junction regional office, located 711 Independent Avenue in Grand Junction. The meeting is open to the public. The landowner voucher program offers hunting licenses to private landowners whose farms and ranches provide habitat for big game. 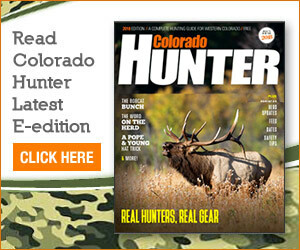 The program has evolved over five decades and today enrolls approximately 5,000 properties across Colorado that allow hunting for deer, elk and pronghorn, according to the release. Under current rules, up to 15 percent of deer, elk and pronghorn licenses in each hunting unit are made available through a draw process for landowners who own at least 160 contiguous acres of agricultural land. The licenses are valid throughout the entire game management unit where the private land is located and can be sold or transferred to any eligible hunter, according to the release. The recommendations for improving the program include changing the proportion of landowner licenses and tightening eligibility rules to ensure that participating properties are used by big game animals, the release states. The recommendations also call for closer enforcement of program rules, including bans on “brokering” of hunting licenses. Those wishing to attend are asked to contact committee facilitator Dave Chadwick at 303-291-7174 or dave.chadwick@state.co.us to reserve a spot.